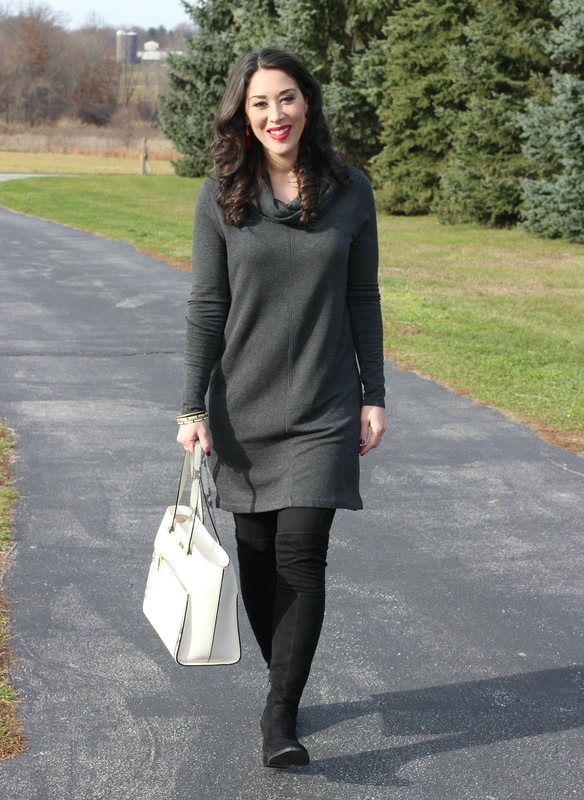 Today I'm sharing a simple yet stylish neutral winter outfit. I LOVE sweater dresses during the winter months! They are so comfy and perfect to wear with your favorite boots or booties. 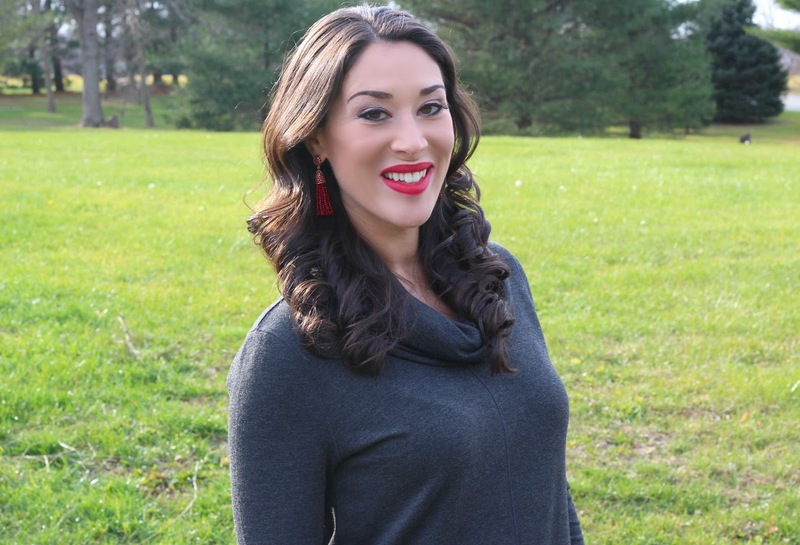 This cowl neck tunic from LOFT is particularly cozy because of the sweatshirt material! When I saw it in stores and felt the material, I HAD to try it on. It is seriously the softest tunic ever! It looks more like a tunic sweater online than a dress, but I'm pretty sure it's the same one. I'm wearing the charcoal color. For other LOFT gray sweater dress options, I love this textured sweater dress and this v-neck swing sweater dress (both on sale for $35, no code needed)! For bottoms, I'm wearing my LOFT Seamed Ponte Leggings. These are my absolute favorite leggings!! They are thicker than regular leggings and much more flattering. Right now, they are on sale for $39.50! 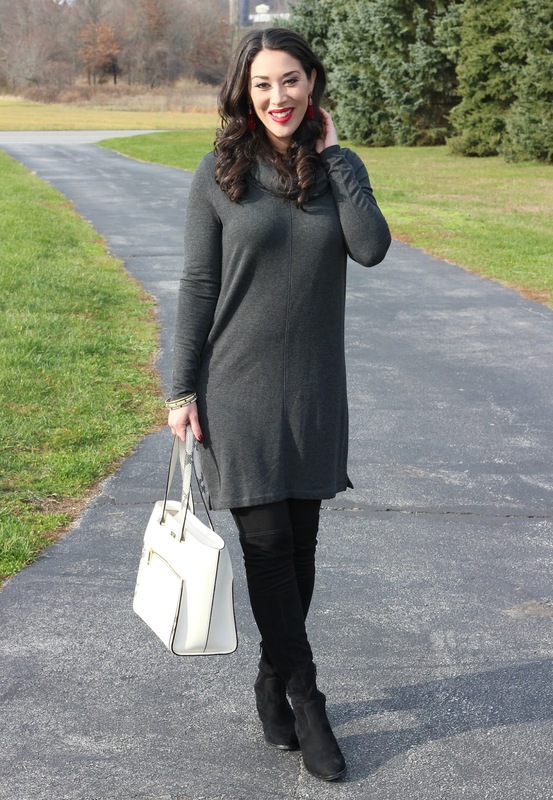 I styled this tunic dress with my Ivanka Trump over the knee boots. They are from last season, but Nordstrom has an almost identical pair on sale for $119.90. These OTK boots are so comfortable and make your legs look longer! 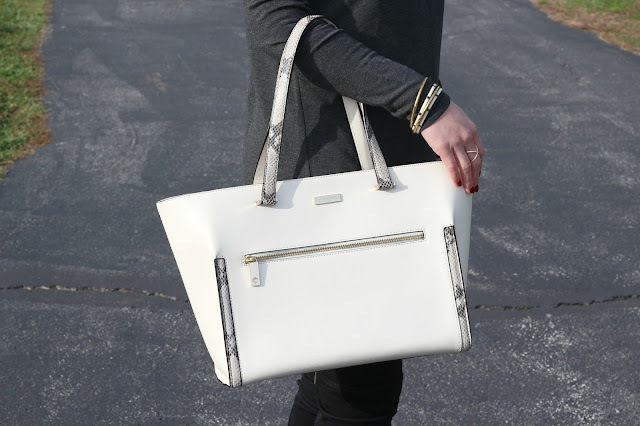 This gorgeous off white Kate Spade bag was a birthday gift from mother-in-law! I don't have any white purses, so I was excited to add this to my bag collection. I love the snake skin detail on the straps and down the sides! White bags are usually worn in the spring and summer months, but I think they are unexpected and fun during the winter. It's also a nice contrast against the gray and black in this outfit! I purchased these sparkly tassel earrings from Baublebar on Black Friday. They came in a holiday set of 2 (red and gold). I love that Baublebar came out with a mini version of their popular tassel drop earrings! The regular size earrings are pretty large and heavy. These mini versions are the perfect size and weight! The red color and glitter detail make them beautiful for the holidays! This is so cute and I love those earrings! I agree, their regular tassel earrings are HUGE but these are perfect. Yes they are the perfect size! You should definitely try a few!! LOFT always has a nice selection. Sweater dresses are the best! This one is great and I love the pop of white with your bag! 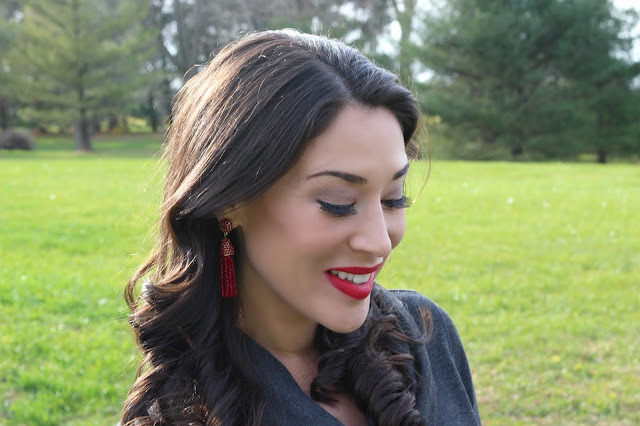 Love this neutral look with the red lipstick and earrings! The OTK boots are fabulous. You look gorgeous and this look works for so many things. Fun winter look. Love the pops of red!